The weather was still bringing a little bit of rain to Riviera Maya, but I was seeing plenty of this region’s beauty through three of the area’s top all-inclusives. I started the day with breakfast in the World Café at Secrets Maromawhere you can literally get anything imaginable. One of the chefs saw me looking at the Chilaquiles (fried squares of tortillas in sauce with green sauce and cheese), and when I asked if there was any without meat they said they would go make me some. The delicious bowl was delivered to my table a few minutes later. After breakfast there was a car waiting to take me over to Now Sapphire, one of two Now properties in the area. I had been very curious about what exactly AMResort’s Now was. I knew that Zoetry is boutique, Secrets is for adults, Dreams is for families, but I wasn’t sure where Now fit in until I saw it. This brand is a bit more modern, a bit more “now.” It is open air, with a preferred section and contemporary look, smaller than Secrets and Dreams, but not quite as condensed as Zoetry. Kids are welcomed here with an Explorer’s Club full of activities for those aged 3-12. The Explorer’s club for kids at Now Sapphire was very nice, but what really impressed me was something I had never seen before – a pool just for teens. At Now Sapphire 13-17 year olds have their own program, their own swimming area and their own nightly entertainment. It’s a wonderful idea since it’s a group that frequently vacations with their parents yet doesn’t want to spend all day with them. As we went through the Mediterranean restaurant I could smell the lamb cooking in the open air. 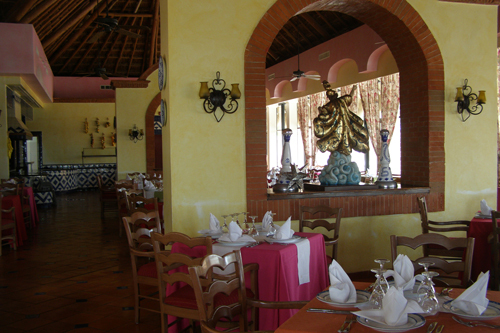 The Adults only Lemon Grass restaurant has three palapas outside for private dining. The spa is small at the moment, but in the beginning stages of a major renovation, mostly to accommodate the weddings that take place here. 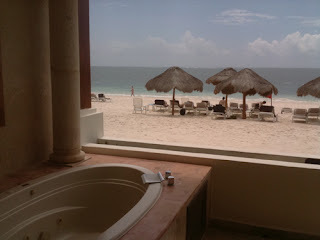 From Now Sapphire Riviera Cancun , I just went down the block to Dreams Riviera Cancun, the newest resort in the area. I think I expected it to be much bigger and was not disappointed that it wasn’t. 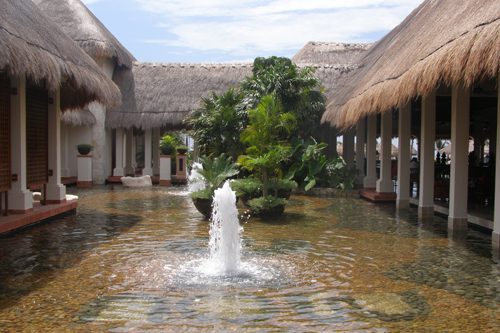 This hotel also has programs for kids and teens, with restaurants, bars and pools throughout the property. I discovered something I didn’t even realize I had a Secrets Maroma – CoCo Café, which is basically everything you love about Starbucks without any cost! The lattes and frozen drinks (I tried a frozen cherry with white chocolate coffee that was perfectly refreshing) are available all day. 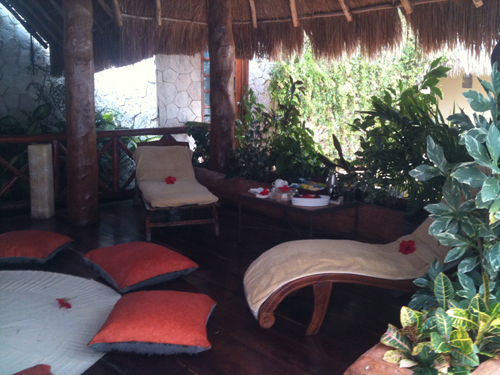 Dreams is also a property that was mostly open air, with a huge lobby area surrounded by tropical foliage. 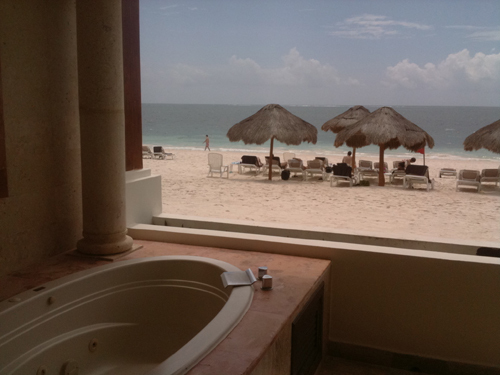 The 486 rooms at Dreams Rivera Cancun are built to take in the ocean views as much as possible and some of the rooms at Dreams are literally on the beach. I loved the outdoor patio at the main restaurant at Dreams. 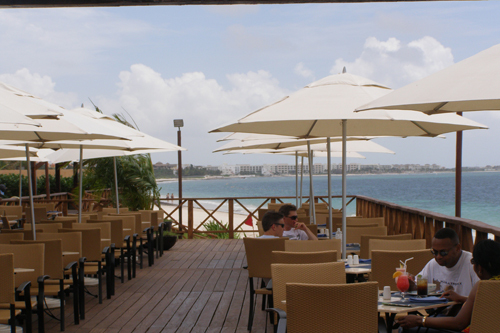 It looked over a wide stretch of beach allowing for very scenic alfresco dining. 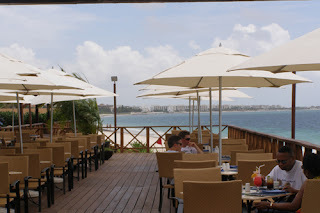 This was one of the outdoor casual dining options that included the Grill, where you can enjoy pizza and burgers, and Oceana, where I had a great lunch with Marco, the Sales Manager, which started with a frozen Cucumber Mojito and some of the best guacamole I’ve had. 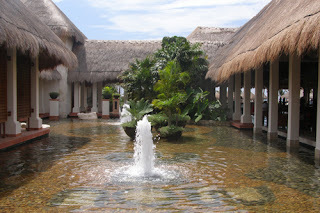 The spa at Dreams Riviera Cancun Resort was rather inviting and I was tempted to stay and check it out more carefully, but I had some free time and was ready to get back to Secrets Maroma Beach. As unbelievable as it may sound, it was this afternoon – after nearly a week in Riviera Maya – that I finally got down to spend time on the beach. That’s just what I did, enjoying my copy of fellow writer Dan Dunn’s “Living Loaded” (more to come on this book) and a Sea Breeze, brought to me by one of the beach waitresses. 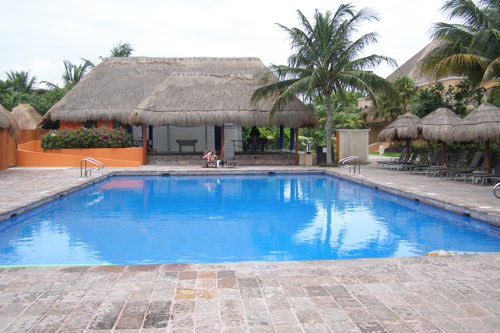 I then spent one more hour at the pool, feeling almost like a vacationer, before it was time to go upstairs and get ready for my final night in Riviera Maya. It was Mexican Fiesta night at Secrets and I was going to enjoy it with some of my new amigas.